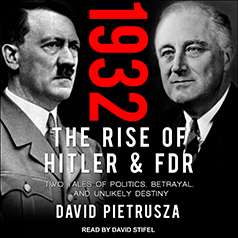 1932 is the tale of spell–binding leaders versus bland businessmen and out–of–touch upper–class elites and of two nations inching to safety but lurching toward disaster. It is 1932's nightmare–with lessons for today. Two Depression-battered nations confronted destiny in 1932, going to the polls in their own way to anoint new leaders, to rescue their people from starvation and hopelessness. America would elect a Congress and a president—ebullient aristocrat Franklin Roosevelt or tarnished "Wonder Boy" Herbert Hoover. Decadent, divided Weimar Germany faced two rounds of bloody Reichstag elections and two presidential contests—doddering reactionary Paul von Hindenburg against rising radical hate–monger Adolf Hitler. The outcome seemed foreordained—unstoppable forces advancing upon crumbled, disoriented societies. A merciless Great Depression brought greater—perhaps hopeful, perhaps deadly—transformation: FDR's New Deal and Hitler's Third Reich. But neither outcome was inevitable.